This review is from a third party. We personally have not reviewed/used this product. We posted the review based on respect for the manufacturer and belief that this product has real value and an excellent history based on consumer reviews. This review is not an actual outdoor field test but a Freeze/Thaw test. Deck Revive is a DIY acrylic-based polymer deck coating that resurfaces old decks, docks, and other treated lumber — in ANY color you choose. Deck Revive repairs and protects wood structures from the constant expansion and contraction cycle that destroys wood. Traditional deck stains, deck paints, and deck sealers just put a new color on old splinters, cracks, and nailheads and have to be re-applied annually. Deck Revive actually fills in cracks and knots, locks down splinters and nailheads, and provides a new slip-resistant textured surface that lasts for years. Unlike other “Deck Resurfacer” type products, Deck revive is breathable, allowing moisture to escape. Scope: Test comparison of Rust-Oleum Deck Restore, Behr Deck Over and Gulf Synthetics DeckRevive. Front panel and edges were coated according to manufacturer-recommended application instructions, leaving the back of the panel untreated. The panel was fully submerged in water at room temperature for 24 hours, removed from the water and placed in 15° Fahrenheit freezer for 24 hours and removed and allowed to recover at room temperature. This process constitutes one cycle. Deck Restore was initially soft and somewhat recovered but can be removed from the substrate with little effort and there was no evidence of substrate cracking through the coating. Deck Over slightly softened and fully recovered but due to its lack of film build compared to the other coatings displayed substrate cracking through the coating. Coverage Per Gallon: 200 sq. ft for 2 coats per kit. *We offer no guarantee of similar results. Take into consideration that results may differ due to different wood types, exposure to UV radiation, and natural weathering. I used GULF Synthetic in Sept of 2015 on my front porch. Today is 5/1/17. We live in NY with harsh winters. The porch gets a little morning sun but is otherwise shaded. Application of this product is difficult but I did it myself. I followed directions completely and made sure I was totally ready to move quickly when I began the process. The porch still looks great with no pealing or wearing noted. I must note we shovel this porch when it snows. I think It is the best product out there to cover that nasty deck situation you might have. The only thing I find to be a very small issue is the “grit” The surface is gritty however it beats splinters. I now plan to do my back deck 1350 sq feet, a huge undertaking. This product is costly but at least it does what it says. I have researched all these products and I think using the Gulf is the way to go. Does the deck synthetc coating show any wear after you shovel?. We get a lot of snow , therefore lots of shoveling and I am looking for a product that would withstand tht. It should. Use a shovel with a rubber edge will help. If you dig into it with metal, it will be an issue. no it held up well. Do you mean that grit releases continuously? We walk into our house onto hardwood floors. I would be worried that the grit would scratch them. thanks. The grit is in the product and does not come off. Is it gritty in a good way, that you have firm traction when the surface is wet? We live in western NY. I also want to avoid the bubbling or peeling in the Summer. I am retired and can’t afford to do the job twice. I want to do it right the first time. Yes it has traction to it so it is not slippery when wet. I have been using the product for 5 years now this will be my 6th year I have no complaints of peeling I love this product and it’s the only one I will use for my business in ct..
current deck has behr deckover which is failing somewhat after 5 years on my treated wooden deck. what type/brand of deck paint can be used to cover it without needing to sand entire deck. my plan is to power wash to clean and remove any loose paint. You cannot apply anything over the Behr Deckover. You will have to remove by sanding. It is not the same product. Different brand and manufacturer. This product works while the Rust-oleum has lawsuits for failures. Do you need to use permabond on a new deck or can you just apply the Deck Revive? You must use the Permabond first. We used this product on a very weathered full sun back deck some years ago. It lasted beautifully for a long time and now we would like to reapply. Our painting contractor advised that this product was so thick that it would not work well since it had been treated previously. Do you have a solution. The product is really incredible. It can be reapplied. Pressure wash for prep. Let dry. Reapply the Permabond and then the Deck Revive. Can Deck Revive be used on a composite deck? Does this product come in a version that does not have the grit? This product was used on my deck 5 years ago. It has held up beautifully. It is now time to spruce up and apply again. What is the procedure? Same as before. Pressure wash for the prep. Let dry. Apply the Permabond. Twp coats of the Deck Revive. One year old Flood (pro series) solid color shows mold/mildew after one year. Yuck. Does Gulf Synthetic protect old deck wood rom mold/mildew? 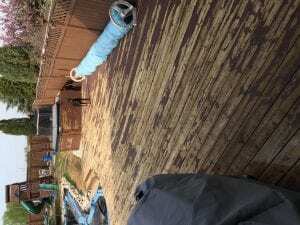 I don’t read any where here (and other sites) if Gulf Synthetic protect deck wood against mold? Flood acrylic stain still cover wood good but removing mold with bleach and water major pain. Any suggestions on what I can do keep “green” stuff away (long term). A deck stain or coating cannot prevent mildew/algae from forming on top of a stain. Does not work that way. A coating can only prevent or stop mildew from growing “in” the stain. What do you use to tint or add color to the “Deck Revive” ? You had gloss paint in any color you want. I’m trying to determine what final color/tint I’ll get. Gulf Synthetics website says to mix one gallon of exterior gloss acrylic latex paint to the one gallon of the liquid component of their Deck Revive. So whatever color paint I add, would be diluted 2 to 1, so to get a specific color/tint, I’d add paint that is about twice as dark as the final color I want? Could I test this by adding a small amount of the tinted paint to an equal amount of white paint and test paint small sections? It is actually not diluted but the color is dispersed to be the same. Your final color will be the same as the gallon paint in our experience. Can it be used in cement porches? Use their Concrete Revive instead. How will this product act if put over a coat of properly prepared DeckOver that has been on the deck for 2 years? It will not fix the peeling issues of the DeckOver. It will need to be removed first if it is failing. Can you give detailed info/instructions on how to apply Deck Revive like what type of brush is best to use? or can a roller or pad be used? or can it be sprayed on? How often does DR need to be stirred/mixed? What quantity is best used at a time? They have detailed instructions on their website. Here are some tips for when we use it. -You cannot spray this. Too thick. Use a heavy nap roller and a “thick” bristle paint brush. -Much easier to do this project with another person. Keeps the product fluid and you will coat it twice as fast. -Only mix 1 of the kits at a time. will this work as well on a new deck that hasn’t been stained before?? thanks! Love the texture and the grit in this product and it is what I expected. Keeps the dogs from slipping and it saved our 20-year-old pine deck from being demoed. I came across this product when considering refinishing a 10 year old PT deck. The deck had an original stain on it, which I was able to clean off pretty easily with a pressure washer. I purchased 2 full kits and 1 Permabond, for a 390sq ft deck. I used a Sherwin Williams exterior gloss acrylic for color.. the color seemed to mix okay. I had this applied by professional paint contractors locally, and after they did one tier of the deck I regretted the decision. This is going to add a great deal of texture and grit to your deck, be aware. I didn’t like it so much that I stopped half way through. I was left with one untouched kit which I am going to return, however the company is hitting me with a 30% restocking fee even though the package is literally untouched. For the premium they charge over the cost of off the shelf resurfacing solutions, its just not worth it. If you are planning on applying this yourself, you are going to be in for a tough time — my contractors were misterable working with it, having to continuously mix it every 10 or 15 minutes to keep it from turning to sludge. Great mistake on my part. Buyer be very, very aware. A few comments on your review. 1. 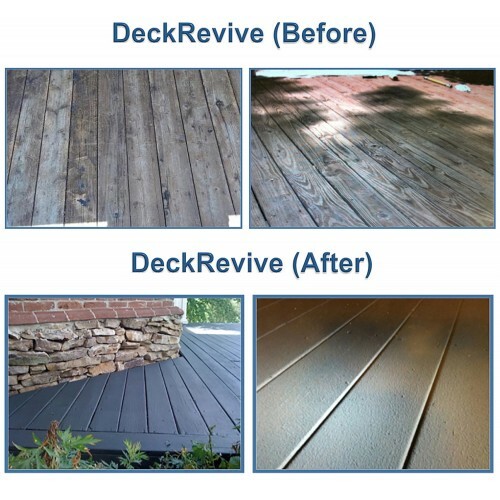 The Deck Revive is a “Deck Resurface” type product. It is supposed to have a “thick” and “textured” appearance like in the pictures above. While you may not like the look or did not realize it, it is what these products are intended to do. 3. We have never had application issues with it. Once you know how to apply, it is similar to painting with a thicker type paint. Anyways sorry you did not like the way it looks but you should not blame the product for doing what it is intended to do. Can you give more detailed information/instruction on how to apply Deck Revive? For example what type of brush is best? Can a paint roller be used? Can it be sprayed on? How often does Deck Revive need to be stirred/mixed? What quantity can be best used at a time? You cannot “fix” the Deckover issues by adding the Gulf on top. Best to fully remove by sanding. We pressure washed it. Used stripping stuff. And pressure washed again. Then sanded. Not all came off. Then used the cleaner. Can’t get it all off. Can I use this stuff now? Post a picture please. What brand is the current stain? I have deck over on it. You can try but if the Gulf Deck Revive fails, it will because of the Behr Deckvoer under it. With the gritty finish, would it be better to paint the fence and railings part of the deck than to apply Deck Revive? If so, would the paint color be different from the product color even if using the exact same paint? You can use a solid color deck stain for the verticals. Just color that to the Deck Revive after application to the floors. I used deck revive a couple years ago and the deck still looks great. However, I want to change my color. What are the steps involved in going over deck revive? Since the permabond has been used could I apply any latex over it like deck and dock from Sw, or do I need to use your product. Also would I need to use permabond again before I use your product or another latex? Same as before. Apply the Permabond first and then two coats of the Deck Revive with your color added. where can you purchase Deck Revive in metro Atlanta ga.
We are not sure who or if anyone stocks it. Best to contact the manufacturer. Jon, no issues that we know of or heard of with high heat temps. Can you apply 3 coats of Deck Revive over Perma Bond? Probably but not 100% sure. Best to ask them. Hi, I just power washed my deck. Let it dry for 7 days. I used Sherman Williams woodscaped exterior house stain that my neighbor gave me. My deck is open to the weather, the color is perfect, but their are so many cracks in every board I think I have to apply another product. What would you recommend. Thanks, Hal. You could use this product over it but make sure to use the Gulf Permabond first. Last year I used a Deck Resurfacer and it started peeling within 1 month. I followed the mfg. directions to the “T”. My question is for the areas where it is still pretty secured do I need to get that removed before using your product? Remove as much as you can. The Deck Revive will adhere to the old coating but it cannot “fix” the old coating from failing underneath it if it is still peeling. Prep with pressure washing. Let dry and apply the PermaBond and then the Deck Revive. I live close to the ocean and my ex used standard decking screws that have rusted. I not only have to do a front entry but also a 14 x 28 deck. In fact, the rusting has run down onto the stained deck surface (steps). I guess my choices are to try and replace every screw with a stainless one or use your Gulf Deck Revive. The deck color is a very light grey (stain). Will your product permanently cover these rust stains? What type of steps will be involved? How hard is this to do (I am disabled with a very bad back)? Rust will continue to bleed. Best to replace with stainless steel screws. What about Deck Revive color choices? Will it cover, colorwise, the darker old stain on my deck? Any color you want. You add your choice of color by adding 1 gallon of gloss paint into the mix. So do you have to strip the old stain off the deck before using this? No. Just pressure wash to remove dirt and any stain that is peeling. You can leaver intact stain on. Use their Permabond primer before applying the Deck Revive. Looking to paint a new deck. Do you recommend using deck revive on a new pressure-treated deck? Sure as long as the wood has dried after install for a few months. Pressure wash for the prep. Can this product be used on a wooden fence? Probably but never tried it. Can I buy this product anywhere in Columbus oh? Not sure, best to contact them directly for help. They make a Dock Revive that would better for this. Can Gulf be used over trex type products? I applied Behr Deck Over throughout the surface of my cedar deck only 2 years ago and like the latetest ratings have confirmed it hasn’t stood up to test of wear, primarily prone to peeling. I am now interested in redoing th surface with Gulf Synthetics. Would I be able apply it overtop of the existing surface followin a light sanding? Having to sand every area down back to bear wood would be such an enormous task. Or, is there any other alternative that you might suggest? According to Deck Revive, you can pressure wash off any old stain that is loose, apply the PermaBond, and then the Deck Revive. The issue though is the Deck Revive will adhere to the wood and the Deckover, but you cannot fix the issues with the Behr Deckover by applying another brand on top. The Deck Revive would be at the mercy of the Behr Deckover potentially failing underneath it. If it were us doing the work, we would remove as much as possible if not all of the Behr Deckover first. We are dealing with the same situation, we used Deck Restore and it’s peeling terribly. We were advised to flip the boards over (cheaper than buying new lumber, but time consuming). Hi – Thanks for the article, probably saved us lots of toil, $ and frustration! My painter told me our deck has been stained and then painted. The best he can offer is to keep repainting every 1-2 years and expect peeling. Do you think the DeckRevive product can help us? It should if prepped and applied correctly. if applied correctly using the perma bond first……..how long can this product last on your deck? 3-5 years before minor touches would be needed. Can Deck Revive be used on a painted deck ? As long as you pressure wash first to remove any dirt, mold, and loose paint and then use the PermaBond as the primer. I put the PermaBond on at the end of last summer. Some areas have worn but most of the deck surface still has the bonding agent in place. Can I put the deck revive on now or should I recoat with primer again? I believe you would need to touch up with both the Bond and the Deck Revive. Can this product be used without paint added in? I would love to just stain my deck or leave it natural looking but with protection from the elements. Can this product be used like that? Would a concrete bonding agent applied to the wood first help these products to adhere better? It works well on concrete I just don't know about wood. These are concrete based products are they not? Use their PermaBond when using the Deck Revive, not a concrete bonding agent. Mistakes were made. We used Olympic Rescue It, which is peeling horribly after 2 years. We tried to pressure wash it off, but it's taking forever. Can we put this over what is left? We want our deck to, you know, not look like crap. I believe so. As long as you remove all the peeling and use the Perma Bond before the Deck Revive, it should adhere. Would this product be appropriate on untreated wood? Our condo building has a stairwell from which we would like to remove the doors – top floor, middle landing and ground floor, remove the carpet and leave open.There would be exposure to the elements near where the doors are removed. I think it would be much cheaper to seal the untreated wood (once carpet removed) as opposed to replacing all wood with pressure treated. Thoughts?? It should work just fine for this. When I applied Deck Revive 4 years ago, I wasn't aware of the requirement to first apply the bonding product first. Unfortunately approximately 40% of Deck Revive has pealed off. I will now have to sand blast the whole 400 sq ft deck and reapplying the Deck Revive, but this time apply the Gulf synthetics binding agent first. Not looking forward to that job!! You would need 1 Permabond and 2 of the Deck Revive Full Kits. The Permabond makes a huge difference and is what makes this products work correctly and last. You honestly think we are making up the lawsuits and failures by the Rustoleum Deck Revive, Behr Deckover, and Olympic Rescue It? There are many 100s of complaints on this site and other sites on the Internet with failures of theses other products. Just read the reviews from customers and see the pictures that prove they have issues. I just received a check from using Rustoleum from a class action lawsuit (only covered 1/3 of the cost to replace for product and removal). They are not trashing other manufacture as it is public knowledge of the lawsuit. Accurate information is appreciated by the rest of us. How is the GEMINI product with heat after a full day of sun exposure? Apparently, the other products get too hot to walk on. We have never heard anything negative about this. Heat is usually generated by the color, not the stain. Darker colors will become hot and retain heat more so than a lighter color. after using the gulf synthetics Deck Revive ……………. what stain or coating would you recommend ? Randy, you do not apply a stain or coating after using the Deck Revive. It is a finished coating. Wish we would have waited. Sounds like a great product, but my question is….am I now stuck with the Behr Deck Over I have on my deck? We only did one coat (I know, bad move!) and ran out of time (weather-related) last year. We were going to do a second coat this year, but there's already peeling going on. Are there any methods to remove some (or most) of the Deck Over? Sand and scrape would be the only way to remove the Behr Deckover. I would contact Gemini Coatings for help with this. Yes but I believe you use the Perma Bond first then the Perma Fill. Deck Revive is last. where can you buy this product? Southfield, Michigan? Hello, contact the manufacturer\’s website for locations. Where can I buy this product in n.y.s. ?